As I've mentioned it's never too early to start thinking about holiday shopping (or to start shopping), especially when you're shopping for kids. Toys R Us knows this only too well. 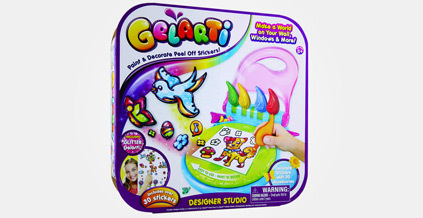 From dolls that look like members of a famous boy band to furry interactive "pets" that speak a "foreign" language, Toys R Us has compiled a list of the most in-demand toys of the 2012 holiday shopping season. Some of last year's best-selling toys are hot again this year. Christmas will just not be the same without Lalaloopsy Silly Hair dolls, LeapPad Explorer tablets and Lego Ninjago sets. If money is a concern this year, consider the 1D Collector Doll from Hasbro, which retails for $19.99 ~ the cheapest item on the list. The average price of the toys on the list is $76, but that excludes the Wii U from Nintendo, which will not be available until Nov. 18. Some items on the list that have yet to hit the shelves may be available for pre-order. 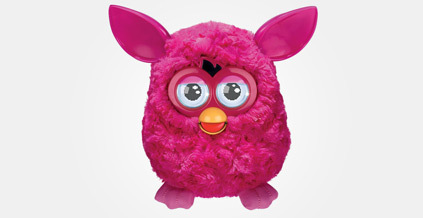 Furby is known as the interactive toy with a mind of its own. Who your Furby becomes all depends on how you play with it.You can feed it, tickle it, play music for it and even talk to it. When you first meet your Furby, it will speak Furbish, but it will "learn" English.If owning a Furby doesn't sound fun (or strange) enough, know that you can have additional fun by downloading the free Furby app, which will allow you to feed your pet virtually and access the Furbish-English dictionary and the Furbish translator.Are you ready to care for a Furby? That'll be $54.99, please. One Direction is a British-Irish boy band consisting of Niall Horan, Zayn Malik, Liam Payne, Harry Styles and Louis Tomlinson. The members of the worldwide musical sensation have now been immortalized in these fashion dolls. Toys R Us recommends these for ages 8 to 11, but fans of all ages have been going crazy for the entire collection. Each doll is sold separately at $19.99, so prepare to shell out about $100 if you want all five. 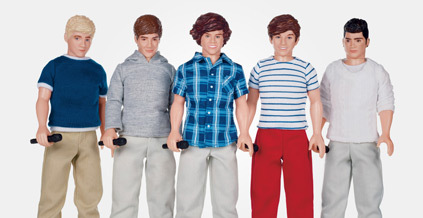 As collector dolls, Zayn, Niall, Harry, Louis and Liam don't sing and dance, so no batteries are required. 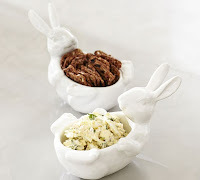 "Doc McStuffins" is an animated television series on the Disney Channel and Disney Junior. It's about a 6-year-old girl, Dottie "Doc" McStuffins, who can "fix" toys, with a little help from her stuffed-animal friends. At the end of each show, Doc gives advice to viewers about staying healthy.This dolled-up version of Doc comes with a "co-pay" of $39.99. 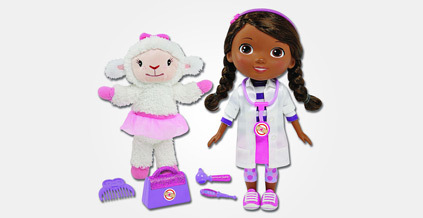 Kids can sing along to the "checkup" song and converse with Doc, who can bring her stuffed friend Lambie (included in the price) to life with the touch of her stethoscope. This is the perfect gift for a child who loves all things crafty -- and enjoys turning walls and windows into works of art. 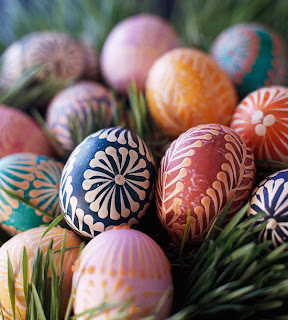 Using paint pens and other tools included in the kit, the little one can design and accessorize a bunch of peel-off stickers.Have no fear if you're the parent and you're not too keen on the "wallpaper" look in your bedroom. 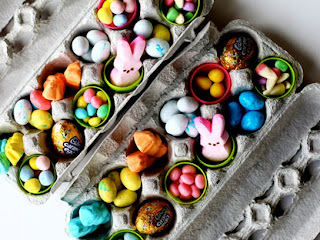 These stickers are easy to remove and reuse. 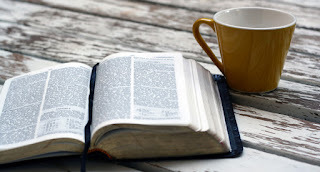 So if you see a bunch of them stuck on the dining-room chair or the coffee table, just remove and stick again to your child's notebook or lunch box! For $24.99, you get more than 30 stickers, paint pens, 3-D accessories, glitter paints and an activity book. 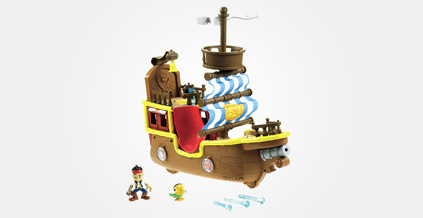 Sailing out of the hit Disney Jr. animated television series, this vessel based on Bucky the Boat is ready to take junior swashbucklers on a Never Land adventure.Rocking and rolling when pushed along any surface, Bucky can bring Jake, along with his parrot Skully, to their next battle with Captain Hook. Kids can live a pirate's life through multiple pirate-themed phrases and songs, while firing "water" out of the ship's cannon or staging a surprise attack from Tick Tock Croc.For $44.99, Bucky comes with Jake and Skully figures and three water-ball projectiles. The Lalaloopsy were once rag dolls that magically came to life when their very last stitch was sewn. 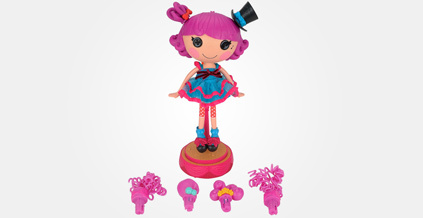 This Lalaloopsy 12-inch Silly Hair Star doll is the first in the line to talk, sing and have "dancing" hair.To get Harmony B. Sharp to sing a new tune, simply change her hairstyle with one of five included snap-on accessories and hats. 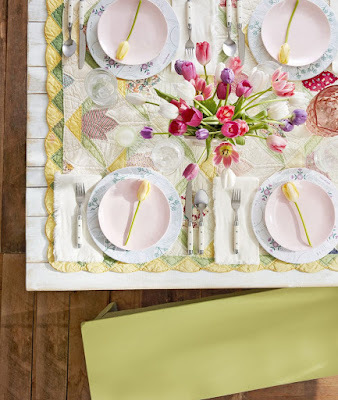 Kids will love the included tiny kitty that chimes in as Harmony B. Sharp sings songs, tells jokes and plays games.This interactive doll set comes with a price tag of $69.99. 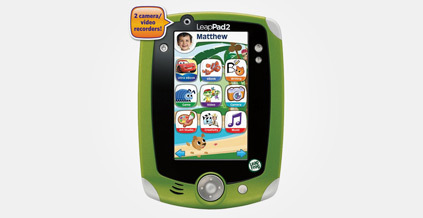 Building on the success of the original, the LeapPad2 Explorer tablet inspires kids to create and explore with higher resolution, front-and-back cameras and video recorders, as well as a faster processor and increased memory.The tablet is filled with free content, such as a music player with five LeapFrog Learning Songs, a new Cartoon Director creativity app, an Art Studio, the Pet Pad writing game and one app that kids choose. They can also play learning games accessible through LeapFrog Explorer cartridges and downloadable digital content.Four AA batteries (not included) power this tablet, which has a price tag of $99.99. Equipped with four lane chargers, this track set lets kids load their miniature cars into a lane, charge them in less than eight seconds, launch them into the raceway and compete against opponents to reach the finish line.Little speed racers will have a blast setting up their own tracks for hours of racing fun with the included curved and bridge track pieces. 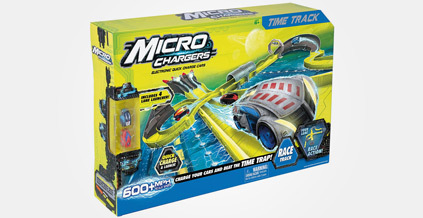 The set features one track race set with four built-in chargers, two trading cards and two exclusive quick-charge cars, as well as a timer mechanism to help record results as competitors strive for personal bests.This track requires two AA batteries (not included) and is currently priced at $34.99. 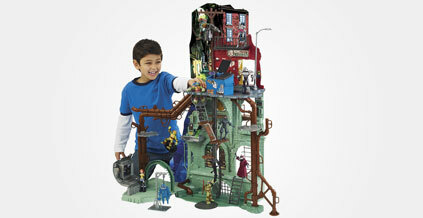 Kids can bring the Turtles back to their home base with this massive, 42-inch-high play set that re-creates their Sewer Lair home and the streets and rooftops above.The Turtles can keep track of the city with a telescoping periscope, practice battle skills on a Shredder dummy, douse intruders with ooze (not included), attach lines to objects throughout the room to rappel into battle and more.Additionally, an elevator can move the Turtles between floors, while Donatello can visit his computer lab to work on his latest invention.This ultimate Turtle play set stands 42 inches tall. It's available for $129.99. 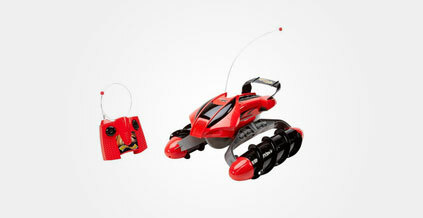 Moving forward, backward and sideways and equipped with pontoons sporting corkscrew-shaped treads rather than wheels, this radio-controlled vehicle is ready to take on nearly any environment.Kids can conquer snow, sand, water, dirt, grass and more while this vehicle, available in red or green, speeds along. Two AA batteries and one 7.6-volt NiMh battery pack are included. Price: $99.99. The holiday toy-shopping season just isn't complete without Legos. 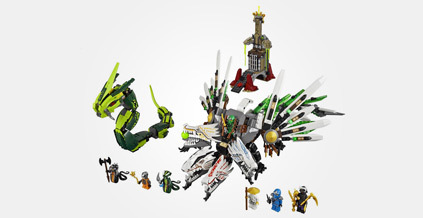 In this year's attraction, kids can defeat the snake-like Great Devourer in the ongoing struggle between good and evil after building the green ninja's four-headed Ultra Dragon. Along the way, the green ninja must defeat the evil snake generals Acidicus and Skalidor and snake soldier Chokun before breaking his Sensei Wu out of the snake prison. Price: $119.99. 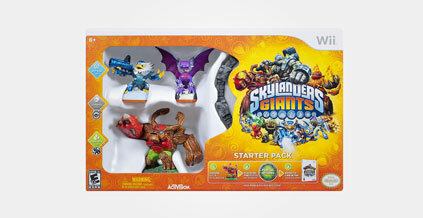 Portal Masters can unleash their favorite Skylanders once again with this sequel to Skylanders Spyro's Adventure that features a new storyline and "Giant" action figures.Players can also bring characters from the previous game to life once placed on the Portal of Power, while maintaining existing upgrades.The starter pack comes with one Giant and two Skylander action figures, as well as the Portal of Power and Skyanders Giants game software for Wii, Xbox 360, PlayStation 3 or Nintendo 3DS. This unique touch-screen tablet, created especially for kids, offers enhanced safety features desired by parents. Designed and developed by Toys R Us, this 7-inch tablet can be customized for multiple users, allowing parents to offer different levels of Internet access for each family member.Additionally, Tabeo comes preloaded with 50 apps, including popular games for kids. One rechargeable lithium polymer battery is required (included).This item sells for $149.99. 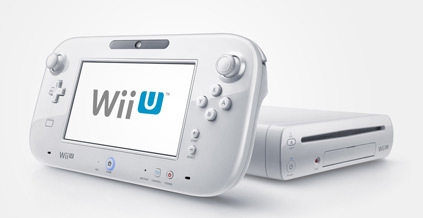 Introducing two-screen console gaming -- one on a TV and the second on the touch-screen GamePad controller -- Wii U offers new possibilities for gaming, allowing players to have different experiences within the same game at the same time.This new system features motion control, high-definition graphics and compatibility with most Wii games and accessories. One rechargeable lithium-ion battery is required (included).This item will become available Nov. 18, with the basic set priced at $299.99. 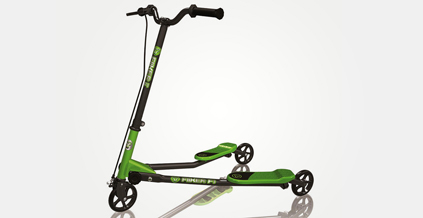 This three-wheeled scooter challenges riders to move their hips from side to side to start moving and keep riding using body power for self-propelling fun.With reinforced steel tubing, three-wheeled design and enhanced foot grips that make it sturdy, stable and easy to balance, this lightweight scooter combines a sleek design with performance-rated wheels to allow for smooth carving and drifting.A quick-response hand brake offers increased control and ensures a safe ride, while anti-vibration hand grips provide extra comfort.As a bonus, Y Fliker can be stored away easily, thanks to its twist-and-stow folding system. Price: $99.99.